Think back to the last movie you saw and your favorite actor performing in that movie. You probably noticed that they had a winning smile that made them look fantastic. Chances are very high that the smile you saw was not the same smile they’ve had their entire life. After all, Hollywood has many tricks to make actors look far more attractive. However, you don’t need a big-budget movie studio just to achieve the smile you’ve always wanted. It’s likely that your favorite actor’s smile is enhanced via porcelain veneers, the best cosmetic treatment out there. Studio City Dental offers high-quality porcelain to create a set of veneers that meets your expectations and yours only. It doesn’t matter what cosmetic issues you have, chances are our veneers can effectively hide them and transform your smile in just two visits. To learn if you’re a candidate, keep reading our most recent newsletter on the benefits of this stunning and effective cosmetic treatment! If you’ve ever needed a dental crown placed, you’re probably aware that it requires removing a significant amount of tooth enamel. By doing this, the restoration can be properly anchored to your existing tooth. When you choose porcelain veneers, Dr. Shahrestany does everything she can to remove as little tooth enamel as possible and still look natural. However, veneers are already incredibly thin, and much thinner compared to other restorations. Thanks to her expertise, she can reduce teeth sensitivity, which has become a known issue for patients considering cosmetic treatments. 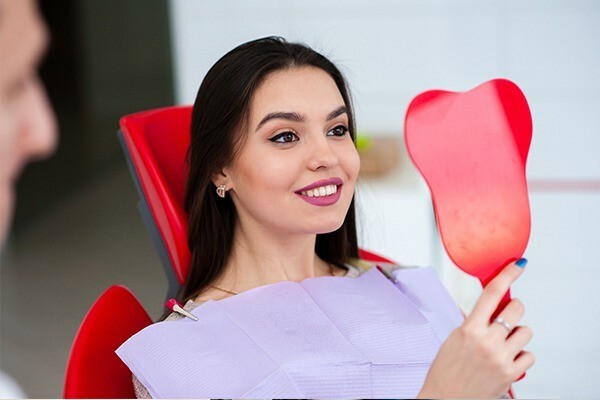 After your teeth receive a thorough cleaning and you’ve discussed what your smile goals are, she can begin buffing down your teeth and take impressions. These molds will be sent to a dental lab and used to create the perfect size and shape of your veneers. Over the next two weeks, you’ll get to wear temporary veneers to help you get used to your brand-new smile. After they’re fabricated, you’ll come back to have them fitted. If you’ve explored cosmetic treatments before, you’ve likely noticed that some treatments take several appointments or long periods of time to achieve full results. Clear aligner technology for example is effective but can take over a year to complete. Teeth whitening works incredibly well but requires regular touch-ups to maintain. Porcelain veneers only require two visits to complete and keep your smile looking beautiful for many years. In fact, veneers can last between 10 and 20 years if properly maintained. No other cosmetic treatment can offer a cosmetic transformation as dramatic as porcelain veneers in such a short time. The gift of a perfect smile is far more permanent than a car or other physical item. It has the potential to be incredibly valuable in your daily life, whether it’s for your job or your relationships. If you, a family member or friend is ready to achieve a truly breathtaking smile, it’s time to set up your free consultation today! Our team can’t wait to meet you and discuss your smile goals.